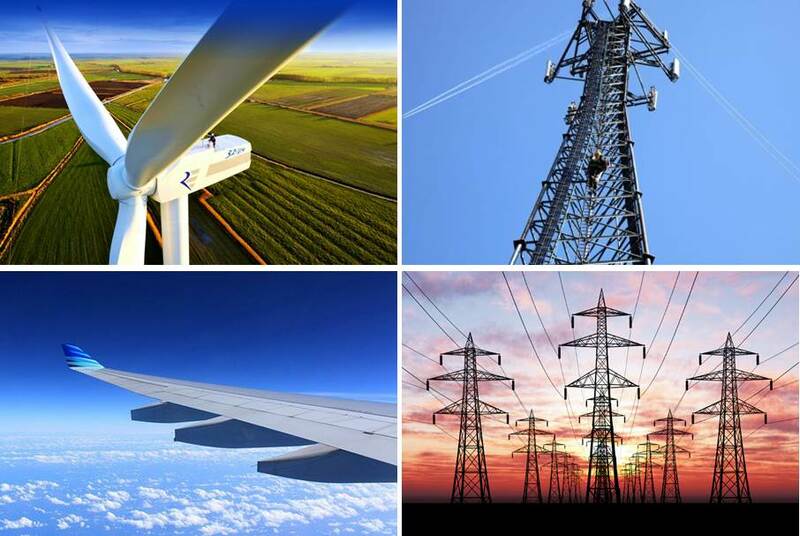 Composites are rapidly becoming the material of choice for various applications. The more familiar carbon fiber composites are used where a lightweight structural material is required. Airplanes, such as the Boeing Dreamliner, utilize fiber composites for their high strength to weight ratio, which ultimately decreases fuel consumption. This also translates to the automotive industry; the lighter the car is, the more energy efficient it can be. Another example is sporting goods, such as lightweight bicycle frames, as they offer a competitive advantage in speed and transport. One can also find composites in newer materials for home decking, where longevity and durability to the outside elements allows these composites to last longer without the maintenance required for wooden decks. While a composite might provide a major benefit over conventional materials, often they have a deficiency in different materials properties. For example, although fiber composites meet the requirements for strength as a structural material, they are susceptible to microcracking and impact damage due to the brittleness of the epoxy matrix. New material developments can overcome these challenges. For example, an introduction of nanoscale additives to the epoxy resin can provide self-healing and/or damage mitigation through toughening. Nanomaterials can be incorporated into composite materials in different ways. The nature of nanomaterials allows them to interact in ways not otherwise possible. This is due to the very small size of the nanomaterial, where such properties as strength and electrical/thermal conductivities can be improved in the resulting nanocomposite. 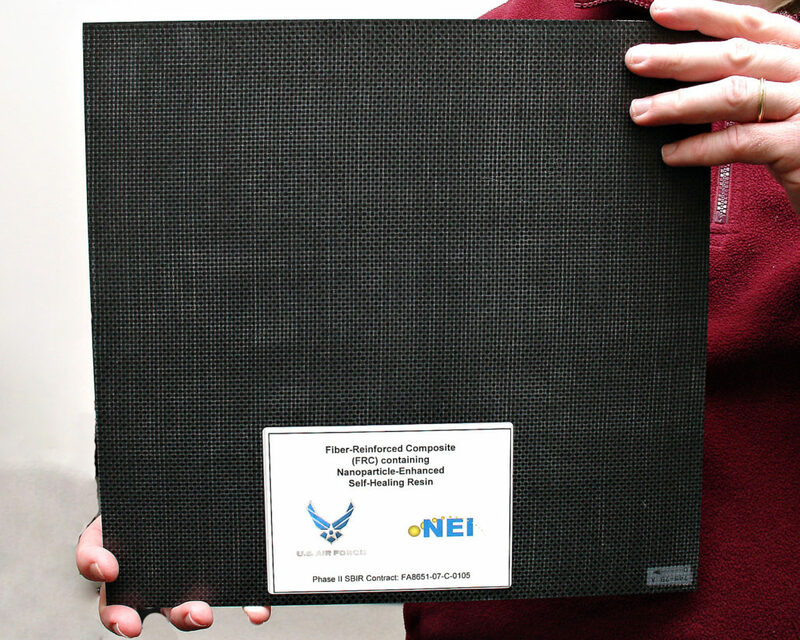 We at NEI Corporation, an Advanced Materials Company, have utilized our expertise to design nanomaterials for making better composites. Improving the reliability, reparability, and reusability of fiber reinforced composites (FRCs) is a key aspect to advancing the current state of the art. The major problem with composites is the inherent brittleness of the epoxy matrix, which is prone to microcrack formation. If not prevented, the microcracks can lead to potentially catastrophic structural damage. 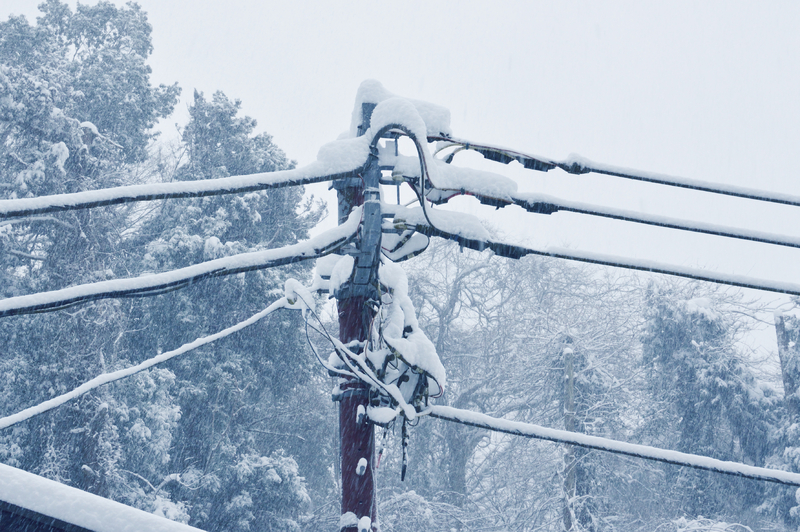 NEI has taken on this challenge by developing several technologies to both mitigate damage, as well as repair any damage that may have occurred. These technologies, based on nanoscale materials and nanoscale structures, can be combined into one composite system to create a toughened composite material with self-healing capabilities (examples shown in Figure 1). Figure 1: (Left) – Self-healing FRC composite fabricated as a panel; (Right) – Composite Overwrapped Pressure Vessel (COPV). The self-healing technology enables the composite to heal microcracks through the use of a novel self-healing agent, which is combined with the epoxy matrix to form a microcrack prevention technology. The two technologies have been demonstrated for proof of concept in FRC structures consisting of flat panel carbon FRCs, as well as in carbon fiber composite overwrapped pressure vessels (COPVs). In the self-healing technology, a brief heat treatment is used to initiate the healing process. Self-healing can be repeated multiple times. When introducing new functions to the composite, the intent is to ensure that the original material’s properties are not compromised. 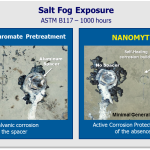 In one resin system containing a surface-modified nanoadditive, a significant increase in burst performance was observed after the COPV was cryo-impact-damaged and then self-healed. 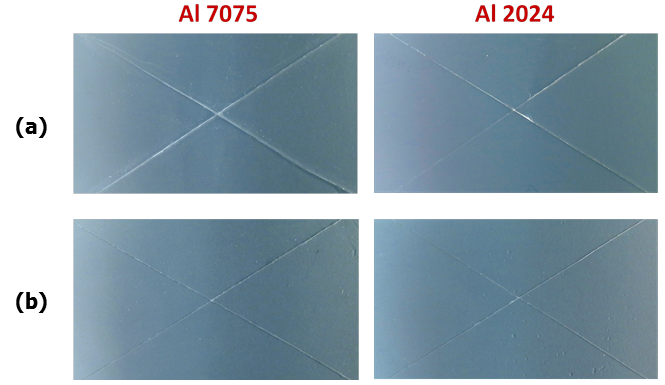 Initial cross-sectional analysis via microscopy showed good resin infiltration of the carbon fibers and no voids. Steps were taken to improve the mechanical properties of the COPVs by using a low-viscosity resin system that contained a different curing agent. This lower viscosity improved the processing of the COPVs, and results show that the burst pressure of these new vessels was 20 to 25% higher than the original. Recently, we have developed a self-healing system that does not require thermal initiation. The system is a multi-scale, hybrid fiber system that incorporates multiple functionalities, including self-healing and increased strength and is compatible with FRC manufacturing. As such, it can be tailored to give specific properties of interest to the end-use applications of the customer. This approach utilizes core-sheath fibers, which comprise of a straw-like morphology in which a self-healing fluid is entrapped within a polymer straw (see Figure 2). When a crack forms and cuts through the sheath, the core fluid flows out and begins to fill the crack before finally curing. Figure 2: (Left) – Schematic of a core-sheath fiber showing the straw-like morphology; (Right) – FRC coupon containing self-healing, core-sheath fibers. Unlike single-target approaches, where one material property is often improved at the expense of another, robustness can be introduced to a COPV by a combination of a modified resin and nanoparticle additives. Unique nanoparticles are surface-functionalized to be compatible with the resin. Both organic and inorganic components toughen the matrix and result in a more impact-resistant COPV. We took this a step further by developing an epoxy composite possessing a uniquely engineered morphology using a completely different self-healing agent, one which has inherent toughening AND self-healing characteristics combined. The novel resin technology is capable of toughening the matrix as well as healing microcracks through the use of a uniquely engineered composite morphology. An FRC containing the newly developed resin was resistant to micro-cracks and was able to repair physical damage. In particular, this resulted in both a reduction in micro-cracks within the bulk resin, as well as evidence of repairable damage due to cryogenic cycling, as witnessed in the recovery of impact and flexural properties of bulk and FRC test coupons, respectively. Mechanical property testing was performed on resin test bars, and strength was recovered after cryo-cycling and self-healing using impact testing (Figure 3). 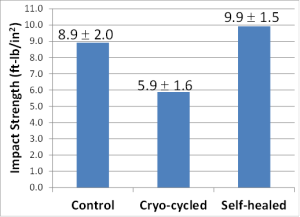 Fiber reinforced composites (FRCs) were fabricated using the novel resin and were likewise able to demonstrate recovery of mechanical properties in the FRC after cryo-cycling followed by self-healing via flexural testing. Figure 3: Impact resistance of epoxy test bars containing toughening and self-healing characteristics. The developed micro-crack prevention and repair resin capability will be a drop-in technology, thus decreasing the overall cost of implementation and manufacturability. The resin can be used for filament winding, layup, or be prepregged. Additionally, as the FRC structures are more reliable, their expected usage life will be extended which is an additional cost-saving advantage. Self-healing is one technology that can be imparted through the use of nanocomposites; however, nanocomposites can also be used to improve the bulk mechanical properties of different neat materials by incorporating nanoparticles into the matrix. For instance, NEI has developed nanoadditives for elastomer seals. These nanoscale particles act as “network modifiers” that have chain characteristics and thus are reactive, bonding to the elastomer network. The altered network structure has unique properties that are not possible with simple nanoscale fillers. For example, the nanocomposite elastomer has improved stiffness while preserving the flexibility and stretchability of a rubber (see Figure 4). Improvements in modulus and hardness, without decreasing the elongation at break, have been obtained in these novel nanocomposite materials. As the network structure largely determines the mechanical properties of an elastomer, traditional fillers (e.g. clay and silica particles) – even if they are at the nanoscale – do not alter the network structure of the elastomer. Therefore, these particles bring unbalanced changes to the properties of the elastomer. That is, they invariably increase the modulus but decrease the elongation at break of the elastomer. NEI’s nanoparticle strategy is fundamentally different from that of conventional approaches. The nanoparticles have been designed to become part of the elastomer network and alter the network structure. 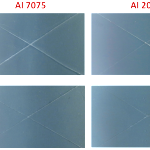 Figure 4: Nanocomposite elastomer seals (left) show an improvement in mechanical properties with increasing nanoadditive concentration (right). The examples above present the platform for new technologies that introduce nanoscale additives as a means to create bulk, composite, or coating materials with unique morphologies and improved physical and chemical properties. NEI has the capabilities to develop novel nanocomposites materials that can be tailored to a specific application. These capabilities include nanoscale particle synthesis including electrospinning for nanofibers, surface functionalization of nanoparticles, and prototyping of bulk nanocomposites materials and fiber reinforced composites. We also have experience in the scale-up of processes through numerous commercial endeavors.